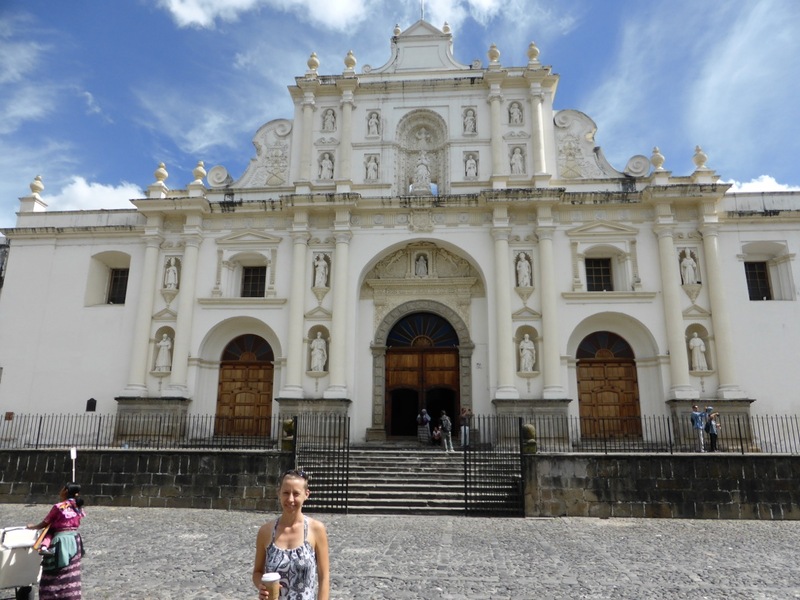 After a harrowing overnight bus ride from Flores to Guatemala City (“Guate”), we connected with our “collectivo” or shuttle bus and completed our journey to Antigua. 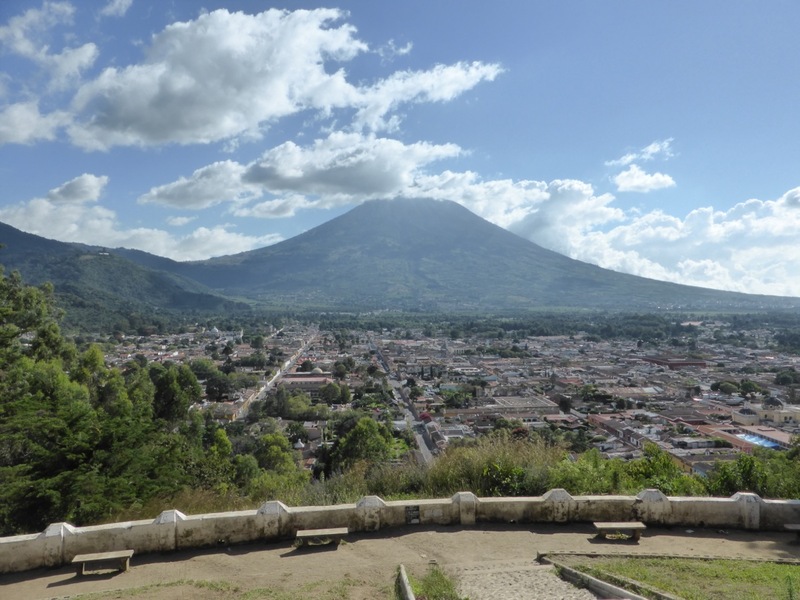 The trip through Guate was interesting – it’s a sprawling city set against a volcano with congestion, chaos, shacks and modern, first world presence via brands and storefronts. 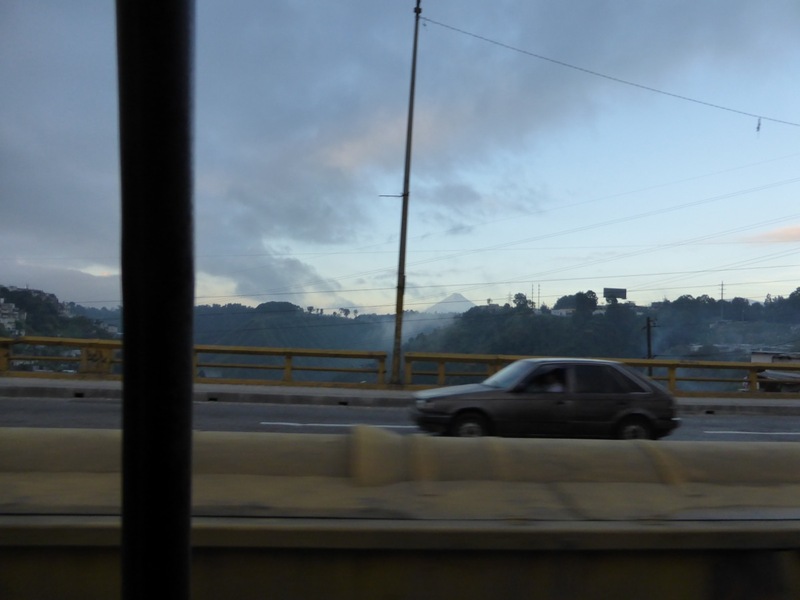 The drive to Antigua was just under an hour through city and countryside. 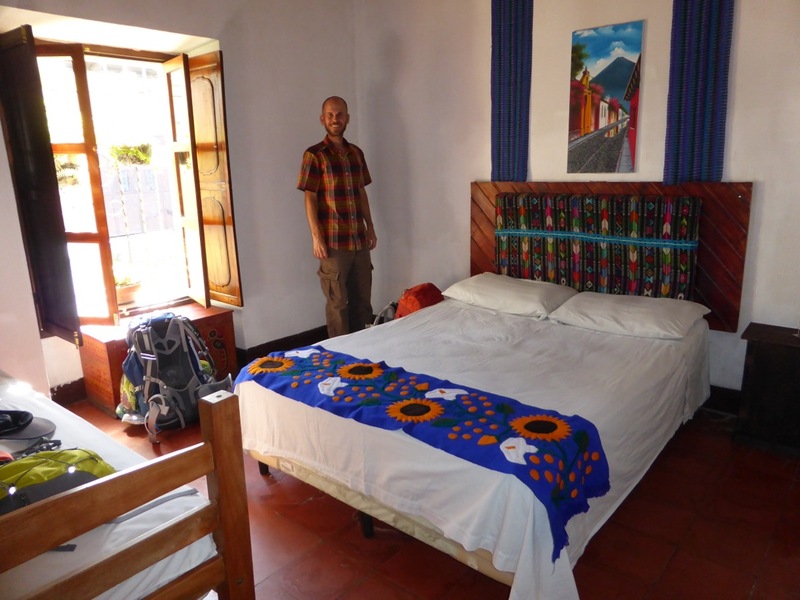 We arrived just after 9am and checked into Hostal Holistico – the base for our 3-night stay in Antigua. We were greeted by the very lively and flamboyant owner, Sergio, who made us feel very welcome and immediately offered us coffee and breakfast. 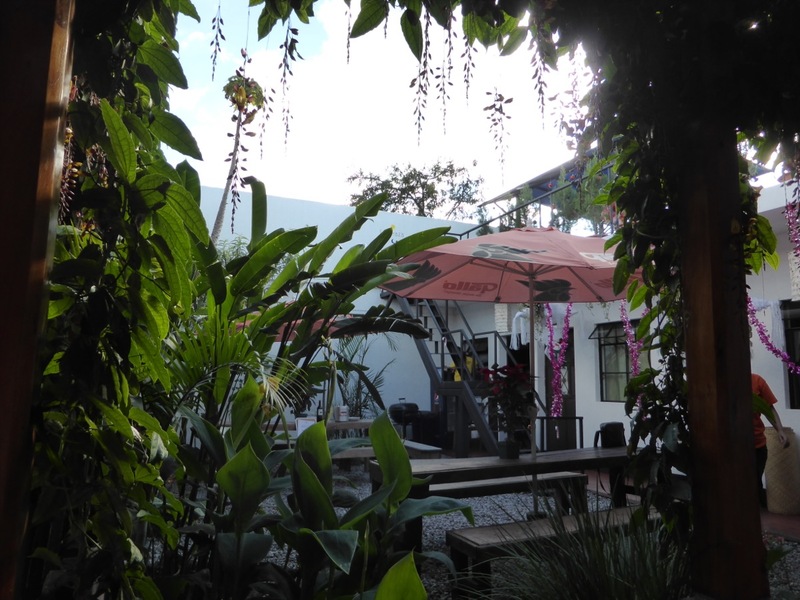 The hostel is arranged around an open courtyard with communal kitchen, seating areas and upstairs patio with gorgeous views over the rooftops and of the volcanoes. The common areas were decked out in full Guatemalan Christmas regalia including piñatas, tinsel and poinsettias. A very comfortable and festive spot for our stay in Antigua! 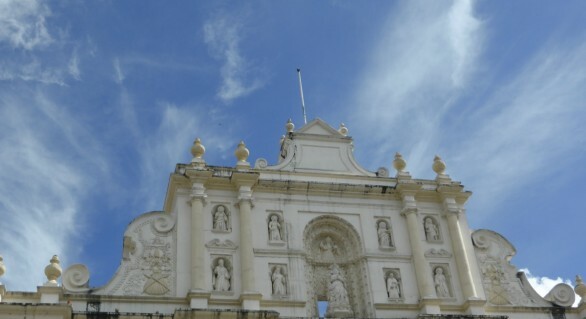 A UNESCO world heritage site, Antigua is a Spanish colonial town with cobbled streets, churches, markets and a lovely public square with fountain. The streets are lined with buildings with enclosed fronts that open up into courtyards, stores, homes etc. All storefront signage is standardized in size and material (discreet and in brushed metal) to ensure that the history and essence of the town is protected. 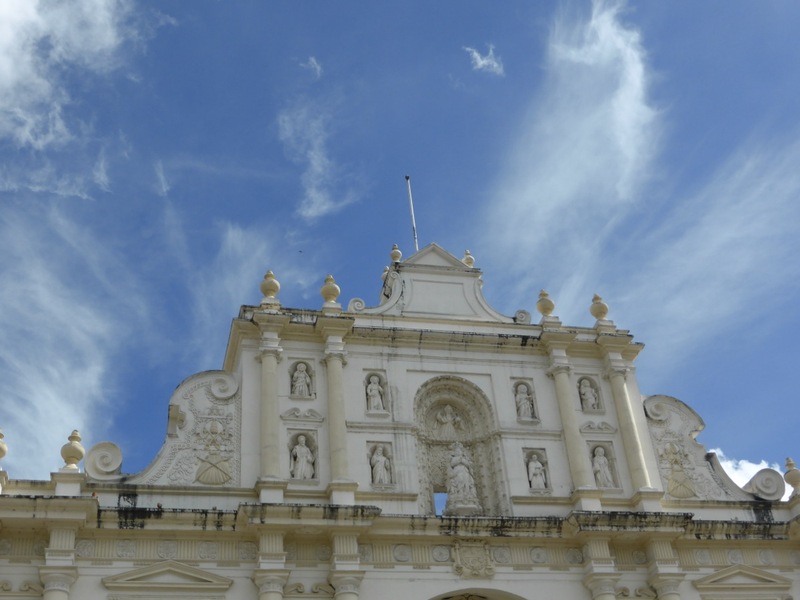 The town is set amidst lush vegetation in the shadow of a few volcanoes – a common theme is starting to emerge here! It has a really lovely vibe and very welcoming, friendly people. 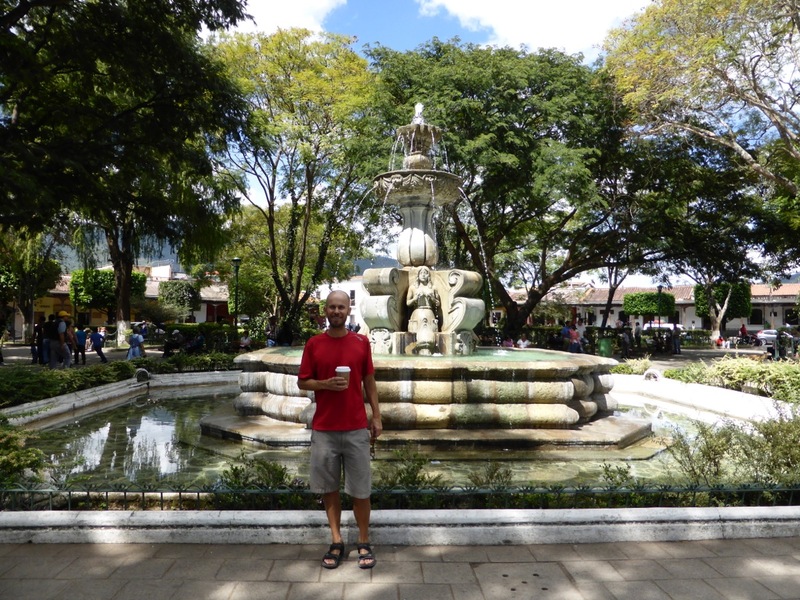 We spent our time in Antigua relaxing, walking, shopping at the markets for fresh fruit and veggies, cooking, drinking delicious Guatemalan coffee, reading, and of course, running. 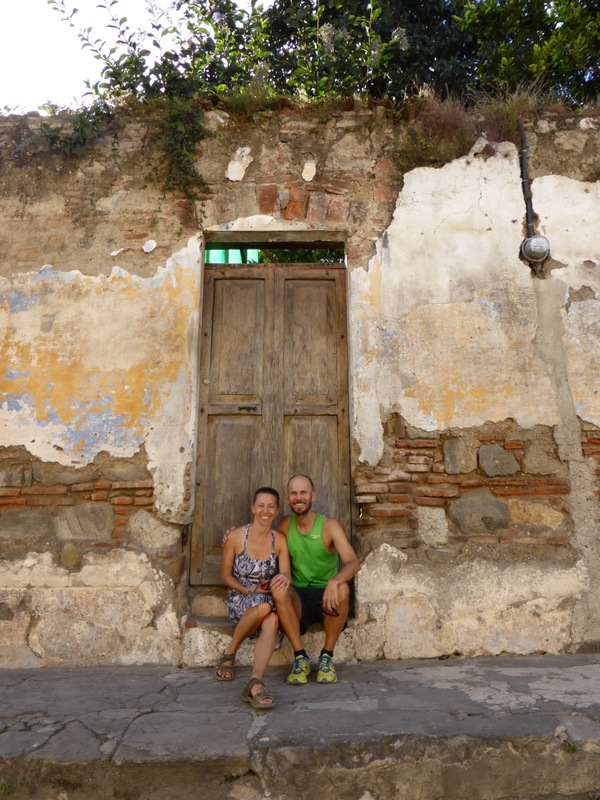 Although the cobbled streets were tough to run on, thanks to friends Nick and Hannah, we explored a lovely run up to a hill with a cross (Cerro de la Cruz) overlooking the town with a winding road into the hillside communities. Roads are steep around here but you’re often rewarded with gorgeous views and amazing scents from various flowers and fruit trees. 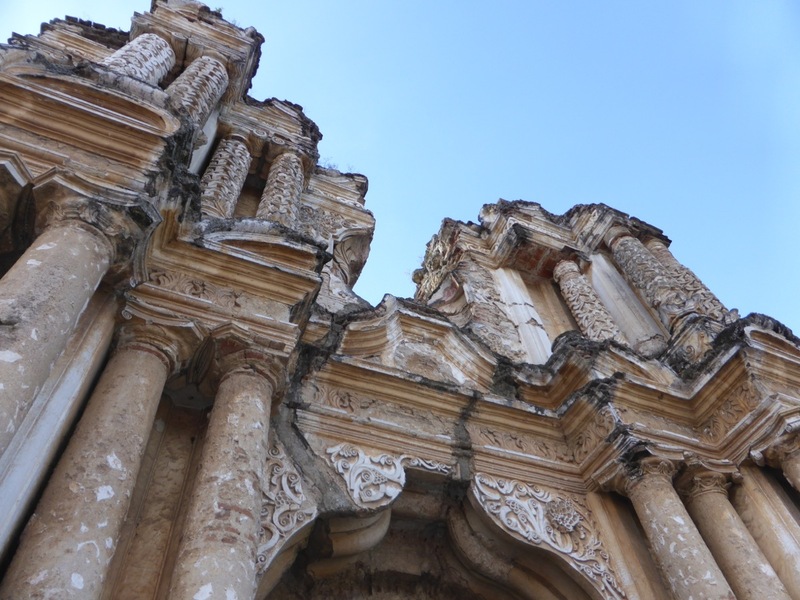 Just one of the many beautiful doorways in Antigua! 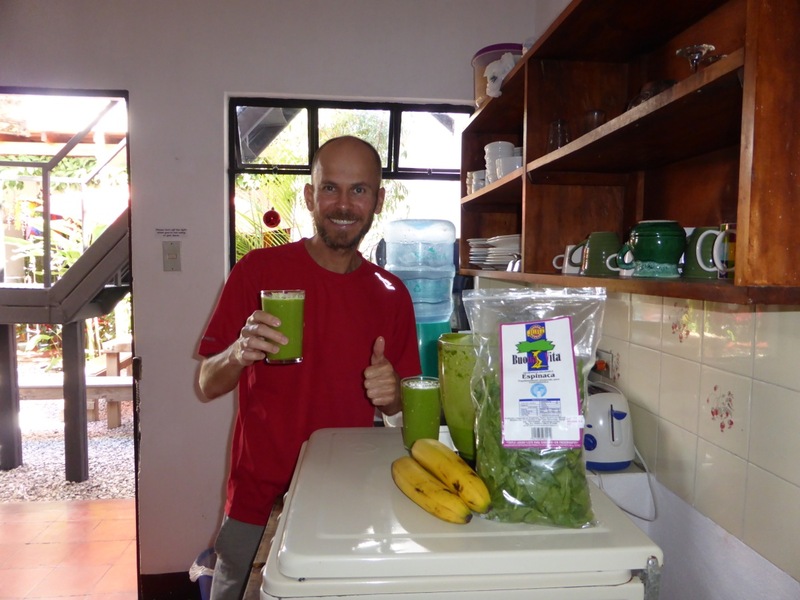 A long overdue and very much enjoyed spinach and banana smoothie! 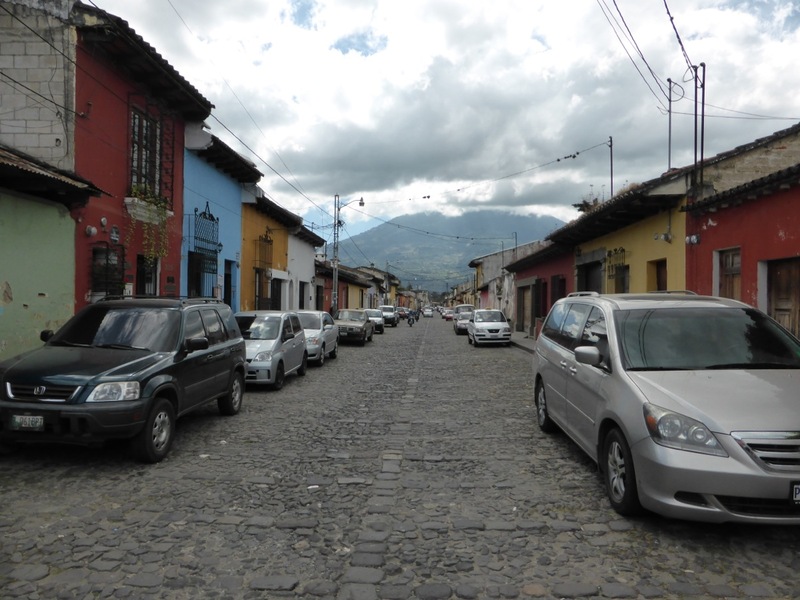 We departed Antigua via shuttle bus for our next stop, the town of Panajachel on Lake Atitlan. 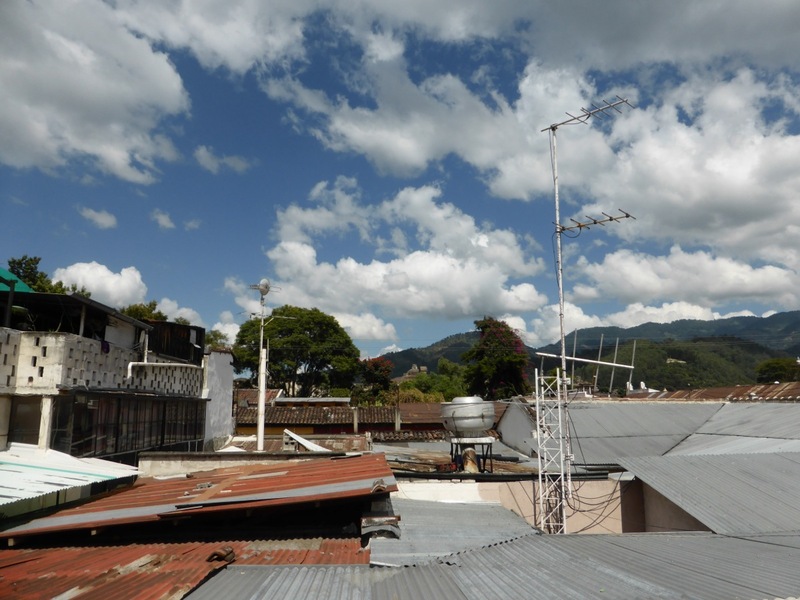 This would be our base for two weeks of Spanish school and immersion into local culture through a home stay with a Guatemalan family. The lake would also be the setting for our participation in the Lake Atitlan Marathon! More on these experiences in the next post! Enjoying your website and pictures. What an adventure! Your trip looks fantastic! I'm enjoying reading about your adventures and dreaming of my next travels.